This BB Cream was from Anna Sui's Beach 2015 Collection, a perfect BB Cream that was created special for you in this spring summer. 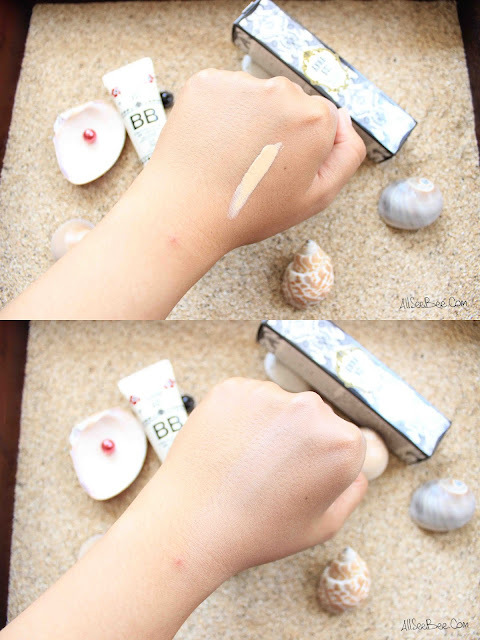 Anna Sui called this BB Cream as a Magic Trick, the secret to amazing skin. It promised you for a smooth and polished skin in one swipe. - Rosa Canina fruit extract for moisturizing and emollient effect. - Hydrolized silk for moisturizing effect. - Lychee seed extract for moisturizing and boost the collagen production on your skin. - Peppermint leaf extract for astringent effect. - Pearl powder for the radiance. The box, super artsy and pretty and whimsical! The box design represent the Anna Sui's Beach 2015 Collection. The BB Cream itself came in a tube with super pretty design, just like how you will expect an Anna Sui's product will be. Yes, I got the shade 01 which is the light beige. The cap detail was oh-so-amazing! With the Rosa Canina flower that represent the ingredient of the BB Cream. You can see how contrast the BB Cream shade and my hand's skin tone (I have to say it that way, because my face skin tone is brighter than this). This is why I kind of panic when I found out that I got shade no 01. I felt that this shade was not meant for me T,T because it was too fair. Surprisingly, after I blend the BB Cream, my skin does look one tone brighter, in a good way. It didn't make my skin look grayish as it has yellow under tone, so it kind of match to my skin under tone. It gave me sheer coverage because I apply it not too much, but you could build up the coverage by applying more product of course. You have to spread the product a little faster before it set and as far as I experience, it did feel lightweight. I think you could see the different, my skin looked less shiny because of the semi-matte finish texture. Oh yeah, it also made my pore less visible. Regarding to you who have dry skin, you should prep your skin with moisturizer before applying this BB Cream. Because it has semi-matte finish, it will make your dry skin look flaky and make your dry area more visible. Here I am with my daily makeup. Yup, just that. No concealer, no eyeliner. As you can see, my face look fresh and polished. Based on my experience using this BB Cream in humid hot weather of Jakarta and I have to walk around, after about four hours my T zone, especially my nose looked oily. But overall, this BB Cream is great! Because it didn't melt away and it gave you what they offered. Thank you Anna Sui Indonesia for giving me chance to try your new BB Cream! Seperti travel size, karena kelihatan kecil. Iya Piccha, itu ukuran aslinya. Kalau dibandingkan sama BB Cream lain, emang ukurannya nggak seberapa besar.